Last Sunday, while the red and yellow leaves gracefully pirouetted to the wind’s frigid autumn song, my family and I slept, tucked under our warm comforters, ignoring the daylight that softly pierced our tired eyes. My mother and I were the first to wake; the dirty dishes from Saturday’s supper warbled my name in an implausible tone, “Kamran, wash us. Kamran, we need you! Kamran, we’ll give you chocolate! Kamran! Kamran . . . ! Kam-.” I gave in after five minutes; for the chocolate (wouldn’t you?). Once the sink sparkled like no other sink in the New York-New Jersey area, my stomach reminded me that breakfast was my next mission. 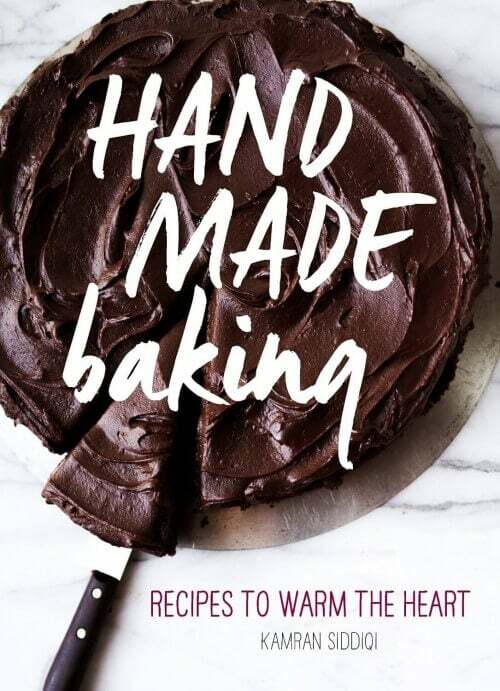 Prune-y hands, grumbling stomach, and all- I scrolled through an endless spreadsheet of recipes for an entire hour. And there it was. It was like the dude upstairs (points up) was reading my mind. 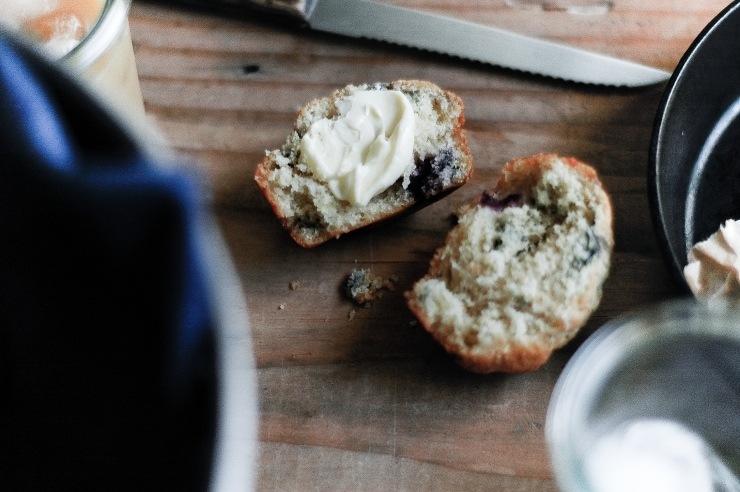 A one-bowl recipe for Perfect Blueberry Muffins. Not having to wash more than a bowl and a few utensils is a gift sent down from the heavens.Everything was as simple as creaming together sugar and butter, and dumping ingredients into a bowl set over a kitchen scale. It was that easy. Honestly. I did change a few things about the recipe- I replaced ½ cup of the all-purpose flour with whole wheat pastry flour. This gave the muffins a beautiful crumb, which everyone loved! As for the sour cream required in the recipe, I used something a little more “gourmet-ish”- crème fraîche. It made these muffins a little more special, making up for the fact that I used frozen blueberries, but you can easily use sour cream or yogurt if you can’t find crème fraîche. Once these babies came out of the oven, I will admit- I refused to let them cool on a wire rack. I opened one with a fork, and spread on a pat of butter. Before I knew it, I ate 4 of the 12 muffins that I made before actually calling my family to the table. Whoops! These muffins are best served right out of the oven and spread with room-temperature butter. You can substitute the crème fraîche called for in the recipe with sour cream or plain yogurt; buttermilk might work just as well. To prevent the mixture from turning blue, you may want to toss the berries in a tablespoon of flour, or you can fold in the berries when there is a little bit of flour left in from the dough. Both ways work equally well. Preheat oven to 375°F. Line a muffin tin with 12 paper liners, or butter each cup. Using the paddle attachment on your electric mixer, beat the butter and sugar with until light and fluffy. Add in the egg, and beat well. Next, add in the crème fraîche and lemon zest. Put flours, baking powder, baking soda and salt into a sifter and sift half of the dry ingredients over batter. Mix just until combined. Sift the remaining dry ingredients into batter and mix just until the flour disappears (don’t over-mix). Gently fold in the blueberries. The mixture will be quite thick (and even thicker, if you used a full-fat Greek-style yogurt), similar to a cookie dough, which is why an ice cream scoop (I used a 1.5 ounce scoop) is a great tool to fill your muffin cups. You’re looking for them to be about 3/4 full, nothing more, so you might only need less than 12 cups. Bake for 23 to 30 minutes, until the tops are golden and a tester inserted into the center of muffins comes out clean . Let cool on a wire rack (if you’re into that stuff) or once out of the oven, break open with a fork, and serve with a generous pat of butter. Enjoy! These muffins look exceptionally good. 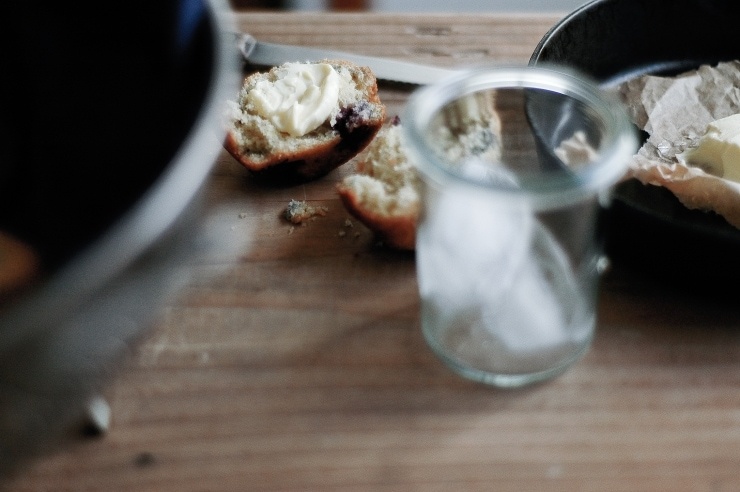 ( I LOVE the top photograph) I wish I had one of the blueberry muffins with a cold glass of milk right now! Those absolutely do look perfect. Especially with that slab of butter. What an eye! Amazing photography, Kamran. Perfect blueberry muffins is a bold statement but these look wonderful. Although I usually don’t go for blueberry in the wintery months, these may be an exception. Lovely photos, how do you like your Nikon? Delicious! 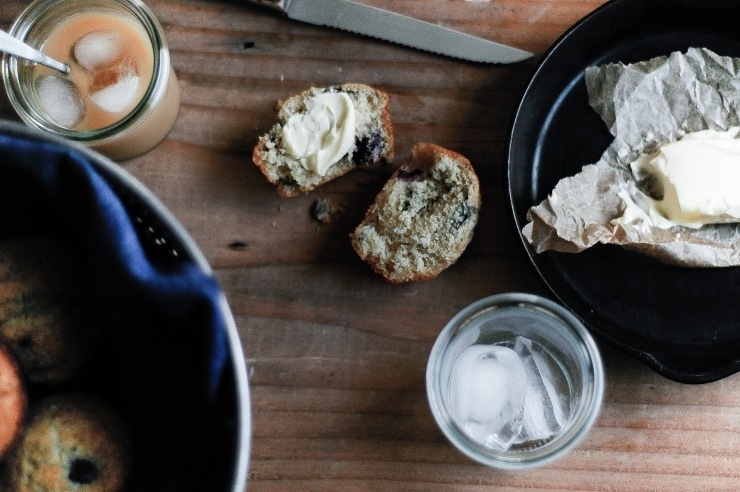 I’m the same way – as soon as muffins (especially blueberry!) exit the oven, I’m hovering like a starved wolf until I can grab a little beauty and devour it in alls it’s warm, sweet, richness. It’s not until they cook that I have to put a little whip cream or GASP! …butter on them. One of my favorites; maybe because frozen blueberries do work so well and they can be a spontaneous treat; especially if any one of the wet ingredients you mention would work; think I’ll experiment with buttermilk in them. Now. These muffins look perfect. Nice job! Hello Kamran, I haven’t visited you in a while. I miss you.. Just browsing through your blog and your photography has greatly improve… (as if I’m one professional photographer).. and as always, your writing is flawless. what a perfect little treat to tuck into on a sleepy sunday morn. lovely. These look delicious! This is my favorite blueberry muffin recipe. I make them all the time! Your site is amazing. Keep up the good work! I love hot blueberry muffins straight from the oven – I’m physically incapable of waiting until they cool. Thank you for the recipe! its 10:30am over here, is it still time for breakfast? (say yes!). I love blueberry muffins. ps. really like the grainy effect of the pics. Smitten Kitchen recipes always work for me and it’s lovely to see your interpretation and share your breakfast through your beautiful images. They do sound pretty darn perfect. Great pictures! 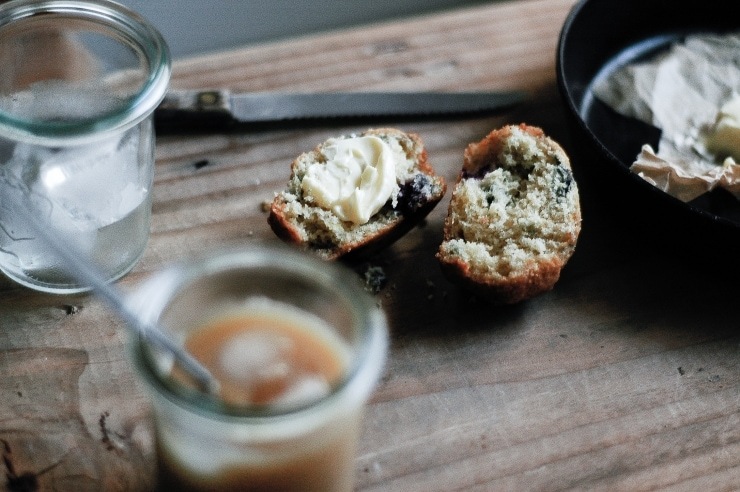 Blueberry muffins are one of those simple joys that can always brighten up my day. These certainly do look perfect! You make them look and sound so divine!!! Those look perfect, indeed! Mmm, wish I had a warm basket full of them with some jam and butter right now. One bowl? Heck yes. I love Cook’s Illustrated so I definitely will love these. I love the changes you made as well! I am making these after the holidays…my kitchen is a big ball of crazy right now! Hi , Planning to make these but notice that most of the comment s are about the photos which are lovley but , the thing is do they taste nice and if I do manage not to eat them all while they are hot , do they keep for tomorrow?